Former President George W. Bush has announced on Facebook the passing of “Barney,” America’s “First Dog” between Jan. 20, 2001, and Jan. 20, 2009. Barney was 12. During his White House years, Barney had his own website. Barney was much beloved by the Bush family. Whether Barney had any sense that he was America’s “First Dog” and that his owner was the President of the United States are, of course, imponderable questions. What’s not imponderable is that dogs provide a special kind of joy as they go about the business of simply being a dog. Barney’s official biography lists his date of birth as Sept. 30, 2000. It’s a good thing that a President can have a dog, but it’s a better thing yet that a dog can have a President — or any other loving owner. The PP Blog holds President George W. Bush in the highest esteem for his service to his country. He is an eminently decent man. Barney was not yet one when his owner, speaking to school children in Florida, was told that an airliner had just hit the World Trade Center . 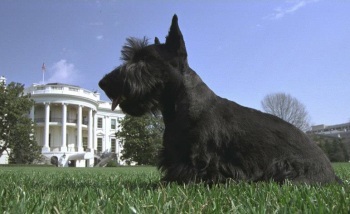 . .
America’s current “First Dog” is “Bo,” a gift to the Obamas from the late Sen. Edward M. Kennedy, a brother of President John F. Kennedy. Thinking of the Bush family today and of how dogs can help even Presidents caught up in extraordinary circumstances reestablish a sense of the ordinary.